Sharpless 2_308 (RCW 11) is a large, faint ring nebula surrounding a Wolf-Rayet star (WR 6) EZ CMa (6hr 54m 36s, -23deg 56m 36s) in Canis Major. I’m using the "Gourd Nebula" because of its shape with the projections at the upper left. It reminds one of a Florence Glass Flask or Round Bottom Flask in a chemistry laboratory. WR6 is the bright, blue star near the center of the image and has been the subject of considerable research. The large yellow star is Omicron 1 CM. The nebula has an age of 70,000 years and an expansion velocity of 60 km/s. It is one of the closest WR stars to our solar system. 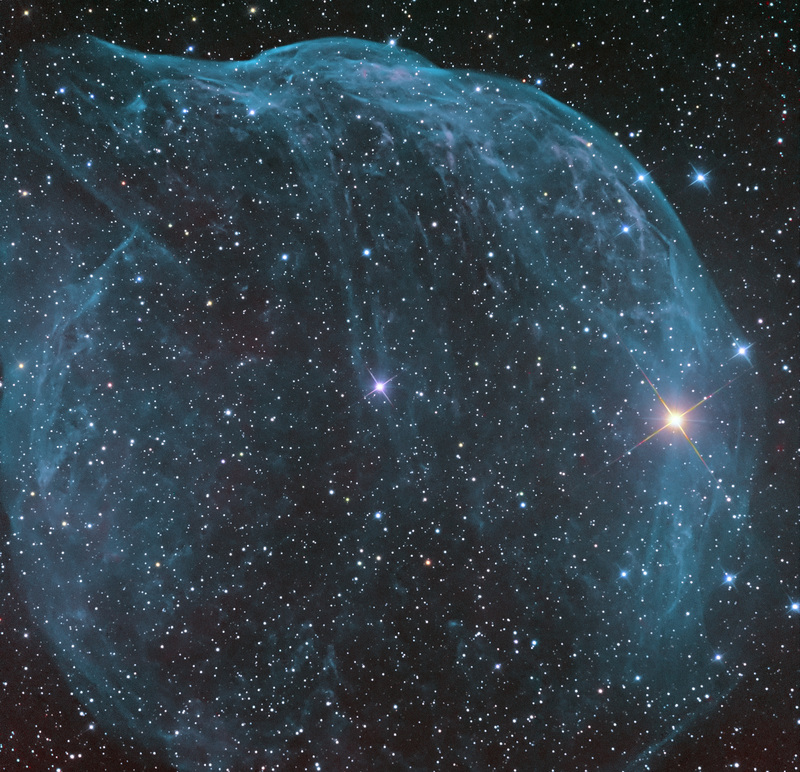 The bubble is large, taking up nearly 3/4 deg in this image, and is the result of fast WR winds sweeping through slower red supergiant winds. The [OIII] signal dominates this structure, whereas the H-a signal is comparably much weaker. Although the object is roughly circular, there is a strange set of projections toward the upper left (North is toward the left). This image was taken with Astrodon 3 nm OIII and 5 nm H-a filters. Star colors were taken with Astrodon Generation 2 RGB filters and blended in. Narrowband colors are mapped to Red = H-a, Green = Blue = OIII. I would like to thank Dean Salman for encouraging me to take a high-resolution image of this object.